The kettle is going on in Hornchurch for High Tea with a difference Friday week. 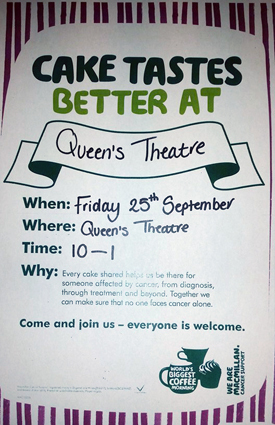 Catering maestro, Karl Dyer at the Queen’s Theatre, has apparently been baking through the nights for a cupcake feast on Friday 25 September from 10am to 1pm, in aid of Macmillan Cancer Support. Karl is also doing the washing up! The event, which organisers hope will end in a pile of crumbs and money, is part of the World’s Biggest Coffee Morning for the Charity. Last year’s event, which the theatre took part in, raised a magnificent £25 million towards helping those suffering from this dreadful illness. A spokesman for the charity said: ‘The event started in 1990, when a local fundraising committee decided to hold a coffee morning where people came along to meet and donate the cost of their coffee to Macmillan. The benefits of the charity’s work are enormous as supported by case studies. Kate from Warwickshire ‘When Kate was diagnosed with cervical cancer, she had a million and one questions. Thankfully her Macmillan nurse Vikki was there to answer them. ‘Vikki stopped me from spiralling into despair. She caught me before I got there.’ And Vikki was still there for Kate throughout her treatment, every step of the way. Tom from Kent ‘I was just 22 when I was told I had cancer. The world stopped when they broke the news.’ ‘My mum and I were in shock and we both wept together but the Macmillan nurse| gave us comfort, she explained that it was treatable and calmed our fears. According to the charity one in three of us will get cancer and for most it will be the toughest thing we ever face. You need a team of inspiring people in your corner with you, something from personal experience I know is so true. I just missed Macmillan, going down with Acute Myeloid Leukaemia twenty plus years ago. Thanks to the expertise of Prof Lister and his team at Barts, I pulled through, so spare a thought for those in a similar situation and raise a brew of steaming coffee and give more than crumbs to this essential charity. Macmillan say: ‘That’s who we are. We provide medical, emotional, practical and financial support and we push for a better cancer care system. We’re the team that gives you the strength and energy to face the fight and get through it.